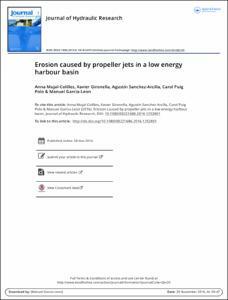 Mujal, A., Gironella, X., Sanchez-Arcilla, A., Puig-Polo, C., Garcia, M. Erosion caused by propeller jets in a low energy harbour basin. "Journal of hydraulic research", Gener 2017, vol. 57, núm. 1, p. 1-8.